Few people enjoy weeding the traditional way. In this modern age of science and technology, the majority of people prefer using the less tedious methods of weeding which involves spraying the weeds with chemicals and waiting for them to kill the unwanted plants. Weeding manually is effective to some degree but it cannot be useful when the weeds are long, woody and established; this is where the best weed removal tool comes in! 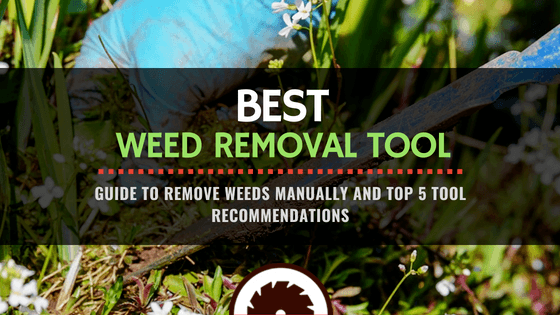 If you are a hands-on person and prefer to remove weeds using tools instead of herbicides, then you are in luck because there are many weed removal tools out there that you can choose from, depending on your preferences and taste. Today, we present you five of the best weed removal tools that you can purchase. How to choose the best weed remover tool for your needs? Why Bother with Weed Removal Tools? Despite it being almost anathema to modern industrial gardeners, using manual weeding tools is often the most effective method available for the job and, most importantly, their use doesn't degrade soil quality. Another major benefit of using manual weeding tools is that their use is safe around children and pets, unlike most chemicals which are poisonous. The method that you use to remove weeds will ultimately depend on your preferences, physical ability, and the type and number of weeds you're dealing with; bearing in mind that some weeds are woody, while others are soft, that some occur annually, while others perennially, and that others are stolons, while others are runners. The type of soil and amount of moisture in the soil also determine which method should be used, and so does the area where the weeds have grown. For instance, is it in the garden or in a rocky place? The importance of weeding can never be emphasized enough. There are several key reasons why you should weed your garden. If left uncontrolled, the weeds become established and they will be hard to pull out without destroying plants. We can all agree that weeds can become a real menace in our gardens. The question on most people’s minds is "how can I prevent weeds from growing and becoming a problem?" There is no definite answer for this question but there are a few things that you can do to ensure that, even if weeds set camp on your garden, they will not grow in large numbers. Covering the soil with mulch (both organic and inorganic mulch) or using a weed-suppressing layer. Organic mulch may be anything from shredded bark, compost of pine straw and inorganic mulch may be rubber or gravel. There are two major types of weed removal tools in the market: short and long-handed. Short-handed tools are ideal for weeding a small area and they will require you to kneel or crouch, while the long-handed tools will allow you to perform the task while standing, and you can easily cover a large area using one. All in all, you might require different types of tools to do the job, since different type of weeds require different tools to remove them. So you need to be knowledgeable about the different types that are available and their strengths and weaknesses. Is the tool ergonomic? Are you able to hold the handle with ease and do I have enough body strength to use it appropriately? Is the tool able to remove roots, including deep roots such as taproots? Is the tool made using durable material such as stainless steel, and is it held together securely? Is the cutting edge sharp? Is it possible to sharpen it when the need arises? Will it help you remove the most common and stubborn weeds in the garden? Do you need other tools to complement it? If so, which other tools should you buy in order to do a proper weeding job? You need to have answers to all these questions for you to be sure that you've bought a good weed extractor that will not disappoint you, and that won't just end up being a waste of money. Don't be swayed by sales pitches at the shops or in ads; use your own intuition and judgment to buy a tool that will serve you for several years. The thing about weeds is that they will sprout back very fast if the root is left behind during extraction; therefore, go for weeding tools that extract the root. Fiskars is an established and trusted brand which is known to manufacture quality products, and this one is no exception. Fiskars Deluxe Stand-up Weeder (4-claw) is one of the best weed removal tools in the market thanks to its excellent features. It is efficient when it comes to removing thistles, dandelions, and other vicious weeds. This weed extraction tool is easy to use since all you need to do is to shove the claws around the base of the weed, clamp down and pull the weed out of the ground. The good thing is that you can do all this with your feet, so you don't have to bend or stoop when using it. This is one of the weeding tools that get weed and root out of the ground, which is one of the reasons it stands out. All these incredible features make it the best stand up weeder tool in our review. This is another amazing weed remover that is long-lasting thanks to its steel construction. To begin with, it has a horizontal top that make it easy to manage. It also has a serrated material claw that will dig seamlessly into many land types. You are also provided with a stepper that you can stand on to add extra force when you are weeding on a hard surface such as clay. When the entire weed is on the soil surface, you can press the push button at the top to release the weed into the waste bin with ease. This tool is one of the best you can find in the market. It makes weed removal fun and hassle-free. You can comfortable cover a large area with this tool. This weed removal tool has a unique design and amazing features, and is one of the best weed puller tools you can find anywhere. This tool features classic features that have world-class craftsmanship, which comprises of elegant details like durable carbon steel blades and oak handles. It is taunted to be bend resistant and has a leather hanger. Generally, it has a classic look and is designed to look like rare antiques that used to be handmade long ago. It removes dandelion weeds effectively as well as a host of other weed species including soft ones and tough ones. The major complaint about it is that weed gets stuck in the fork forcing the user to release it by hand. It is quite affordable at a price of $8. Cobrahead weeder as the name suggests has a cobrahead look and is curved. There is both a short-handled and long handled version. This is great weed removal equipment that you should consider buying if you are in the market for one. Proclaimed to be one of the strongest hand weeding tools out there, its shape enables the user to cut tough stems as well as dig with accuracy in any type of soil. The CobraHead is able to dig deep under the plant and remove the taproot hence it will not grow back. Furthermore, it is quite flexible as it can be used to do other tasks around the home such as digging to create bulb hoes, trenches as well as to plough around delicate plants among other uses. This tool features a comfortable handle and has leverage properties. We consider that this tool is perfect for removing weed that cannot come off easily by hands and it can cover large areas. Not only this, but it also has many positive reviews on the web, which is a testament to how effective and useful it is. All these things make it one of the best hand weeder alternatives on the market. In essence, it is also the best weed control tool for flower beds, since they require careful weeding to avoid breaking the delicate stalks. This tool has been around for more than a hundred years. For years, it has helped farmers to remove weeds and plants. We believe that its increased popularity is attributed to its ease of use; it's a lot of gardener's weeding tool of choice because of its efficiency and ease of grasping. Grandpa's Weeder is designed in such a way that it can be positioned as a lever and used to pull out weeds along with their roots. This ensures that the weeds will not grow back soon after the weeding has been done. Furthermore, this tool is reasonably priced and costs about $30. It also has a stylish design that has been recently upgraded to include powder coated steel and a bamboo handle. Selecting the best weed removal tool is a bit challenging because of all the factors that we had to put into consideration. 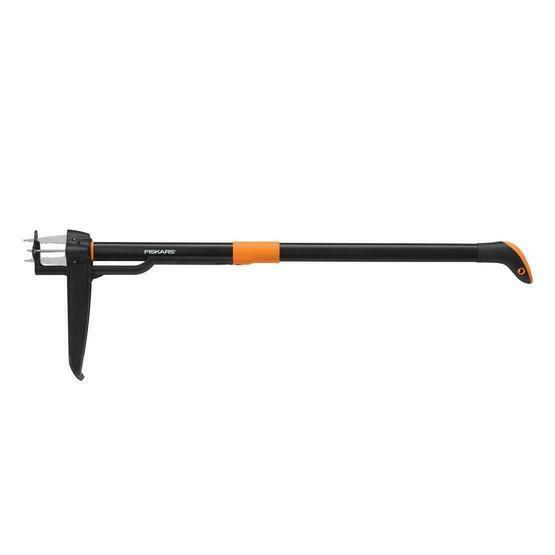 However, we decided to give Fiskars Deluxe Stand-up Weeder (4-claw) the first position because it has met most of the requirements we were evaluating and most importantly it is agronomical. Therefore, even an elderly farmer can manage to keep their garden looking beautiful with this tool without spending a lot of money hiring professionals to do the job for them or buying chemicals that could damage the quality of the soil. The Fiskars Deluxe Stand-up Weeder (4-claw) is a product that has been manufactured by a company that has been around for years. Don't forget it's also made using stainless steel, which guarantees you that it will serve you for many years without rusting or breaking. It performs exceptionally well when the ground is wet and can cover a large area without making you feel exhausted. 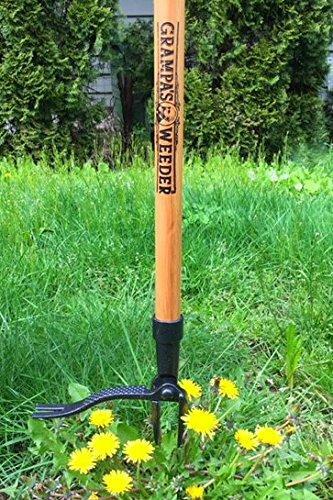 This tool is undoubtedly the best garden weeding tool in the market. If we compare this weed extractor with other tools, it beats them on many levels. For example, if we pit it against grandpa’s weeder realized that it is steadier than the grandpa’s weeder equipment. Grandpa’s weeder vs Fiskars comparison also shows that despite Fiskars being a bit more expensive than Grandpa’s weeder, it has more positive reviews from customers than its counterpart, which proves that it is efficient and reliable.